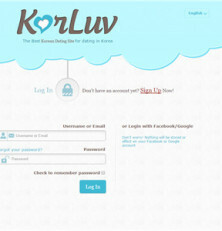 KorLuv.com is a quite new Korean dating site compared to other dating services out there. Established back in June 2013, in order to gather online contact between Korean residents and those living outside the country with western admires. Unlike other dating sites this one seems to be target rather only for man looking for a woman. What makes this site unique is access to other social networks like KorLuv Facebook page, twitter or Youtube account where you might find useful info and nice videos to spicy up your desire of having Korean Lady. Website design is quite good looking one with blue and white theme. There’s not much information on the main page which makes interface clear and welcoming. There’s simple menu and some brief introduction for KorLuv page. What is good it’s a short note on the main page with most important announcements which are changing during the site grows. You can have a sneak peak before you log in on who’s visited KorLuv recently. Site is available in both English and Korean. What is best here is the fact that all basic features for searching and communication works for free with no hidden costs. Searching tool is clear and let you make a research by gender, country, age, weight and ethnicity. Also you can browse profiles of users who are online at the moment, so if you feel like having a short chat with somebody, use these criteria for sure. Another good feature is how user’s profile is shown up. After click on profile who gathers your attention not only you see a pictures but also short info what kind of people this particular user is looking for, when was the last time this user log in and if this users replies to message often or not really. This messages indicator is a great way to check if user is worth talking or not. Of course you can save particular profile or show interests to break the ice but what is worth mention here are short private memos you can write under every profile to point out the most important information like birthday or phone number. Obviously only you can see what you wrote in the memo box. After making an account you can use most of the features as free member. You are allowed to search, contact with 1 message per few minutes, reply to messages from other user. Basically unless other dating sites, this one gives you opportunity to start dating for free. However it’s possible to upgrade your account for no time limited messages, advanced privacy settings, no ads and your profile’s listed before free members. Prices for Better Account starts from $14,95 per month and $99,95 for one year. Unfortunately there’s no related mobile application, however you can change page view into mobile one to get easier access to all functions. Registration process is free and takes maximum few minutes. You can create an account by email, Facebook or Google. After giving basic information, adding pictures is optional however keep in mind that your pictures need to be approved by KorLuv administration within 24 hours. This dating service passed few online tests for security and safety with positive results. It’s easy to use and register there. What’s more on the main page before log into, you can see brief reminder about scam or spam issues. All payments go through PayPal service. To submit inquiries, demand additional information or share concerns, complaints or other messages, users can contact KorLuv customer service via e-mail. If you are a western single in Korea or outside the country who dreams of dating a cute Korean girl or just looking for a fun, KorLuv.com is the one social network to help you find a friend or a date. Definitely this website represents a modern approach of dating that offers Korean singles unique opportunities: meet their other half as well as gain new friends and experiences.